Mini-golf’s first big boom was 85 years ago. Back then, there was nothing little about the industry. By August 1930 there were over 25,000 mini-golf courses. They were across the country. That's according to the New York Times. At the same time, there were only about 6,000 regular golf courses in America. 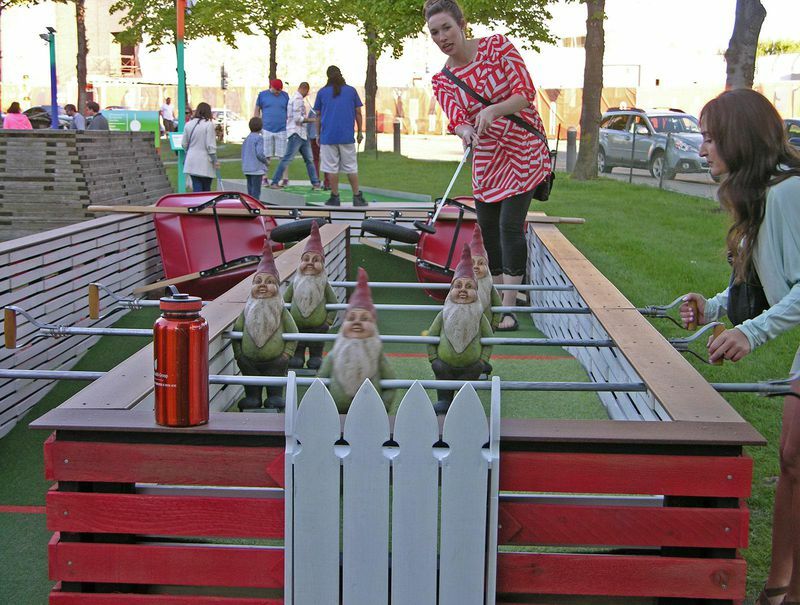 The sport of mini-golf used to be called "midget golf." By some accounts, it first appeared as an alternative for women. This was due to the belief that regular golf was somehow unladylike. The first putting-only course in the world was built in 1867. It was built at the famed Scottish course of St. Andrews. It was built solely for the St. Andrews’ Ladies Putting Club. Par-King Skill Golf: Lincolnshire, Illinois. 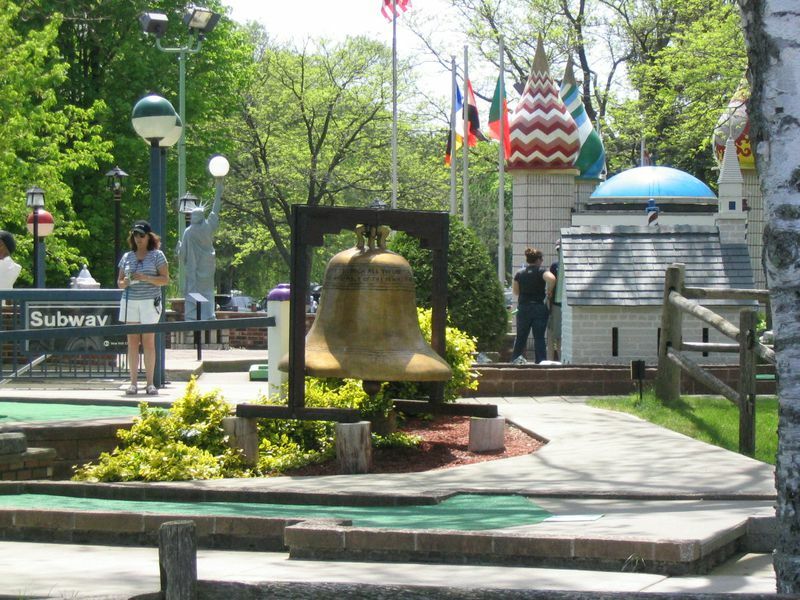 Amusement Business magazine called this mini-golf course “Mini-Golf’s Taj Mahal.” It is in the suburbs of Chicago. This was fifty years ago. They said it was the most elaborate course in the country. It was also the highest-grossing. The multi-generational family-owned business is still thriving. 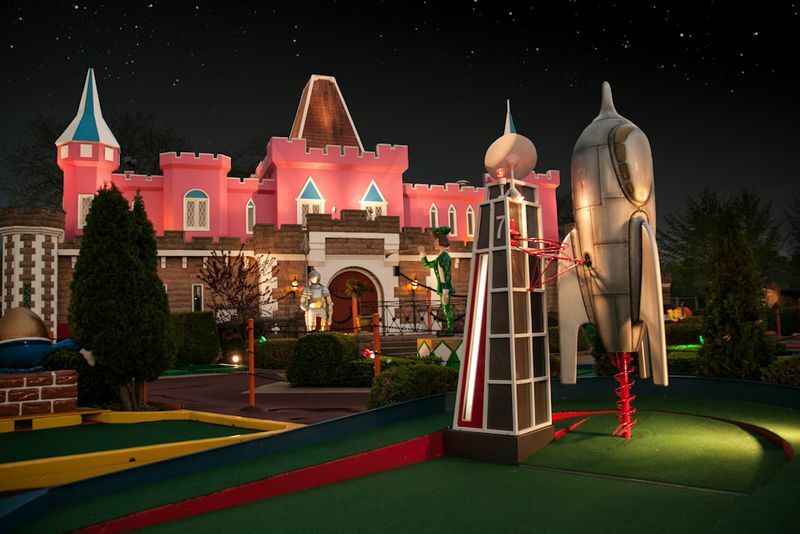 The family refers to Par-King as the ″World’s Most Unusual Miniature Golf Course.” This is due to its many elaborate obstacles. It has a scale model of Mount Rushmore. It has a hand-crafted carousel. And it has a replica Statue of Liberty. In 1975, the owners added a miniature wooden golf coaster. It is like a roller coaster. But it is designed to carry a golf ball. In the early 2000s, they added a steel “Super Looper” coaster. It carries the ball upside-down. They are the only two like them in the world. Walker on the Green: Minneapolis, Minnesota. In 2014, the Walker Art Center of Minneapolis reached out to local artists. They wanted help to design and create a fun family activity. They wanted it to be one-of-a-kind. It was for their sculpture garden. It is in downtown Minneapolis. The result? 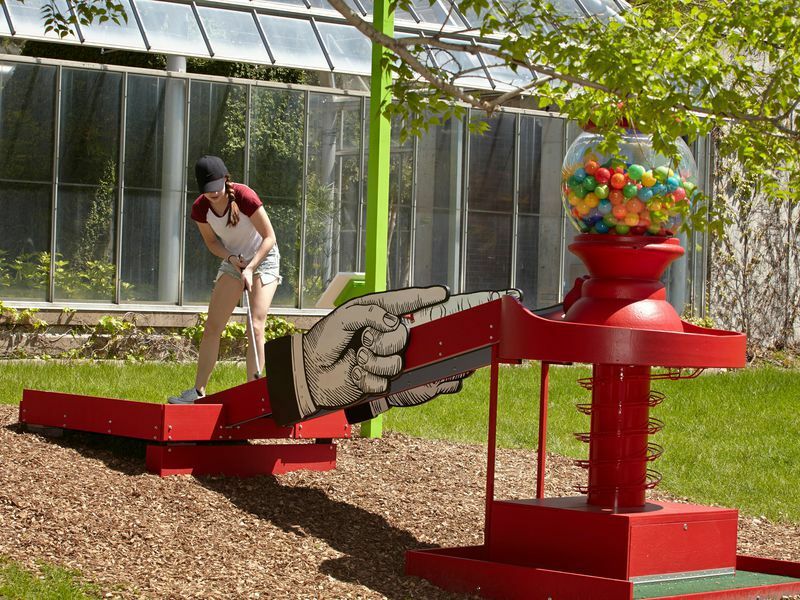 A course at the Minneapolis Sculpture Garden that turns every hole into a piece of art. It is now in its fifth year. This is a 10-hole course. It offers unique and downright confusing challenges. In the past, one hole used the “uncertainty principle” to make putters guess which of the eight holes is the right one. Another hole involved a cemetery. One had a billiards table. And another had a musical Zen garden. It is open until the beginning of September. This is a summer-only activity. Disney’s Fantasia Gardens: Orlando, Florida. Disney’s Fantasia Gardens is at the Walt Disney World resort. It boasts two 18-hole courses. Each is eye-catching in a different way. One promises to delight children. The other emphasizes skill. The more family-friendly course is themed around the 1940 Disney hit Fantasia. It has pirouetting alligators. It has dancing water fountains. And it has spinning mushrooms. 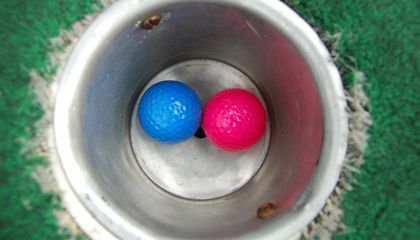 These accompany players as they putt their way through 18 holes. Music from the movie is part of the experience. This includes surprising sound effects for hole-in-ones. Around the World Miniature Golf: Lake George, New York. Harry Horn was a young man during World War II. He traveled across the country. He was a Navy electrician. He was also a pilot. He finally settled down in his hometown of Lake George, New York. Horn put his experiences he brought back to good use. He also used the souvenirs he collected. In 1963, he opened “Around the U.S. in 18 Holes.” It is a mini-golf course. It is his own design. He also built it. There are many popular holes on the course. There is an ax-wielding Paul Bunyan. There is a giant lobster. There is also a miniature replica of a New York subway station. 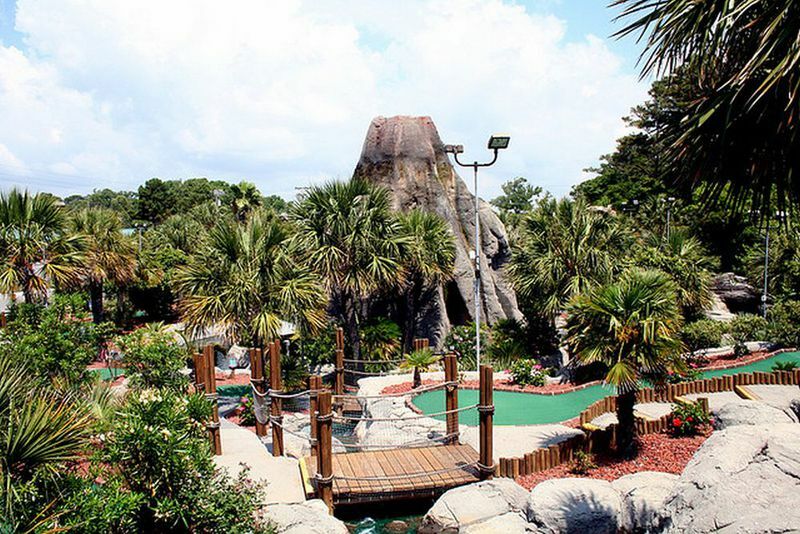 Hawaiian Rumble Mini-Golf: Myrtle Beach, South Carolina. Imagine lining up a putt. You are at a mini-golf course. You are several feet from the 18th hole. All of a sudden, a giant volcanic explosion rocks the green. It also shakes everyone’s concentration. Does this seem like a welcome interruption at a golf course? Maybe, not. But it is exactly what happens every 20 minutes. It is at a course that’s been featured in Golf magazine. It has also been in the New York Times. It is the Hawaiian Rumble. It is in Myrtle Beach. 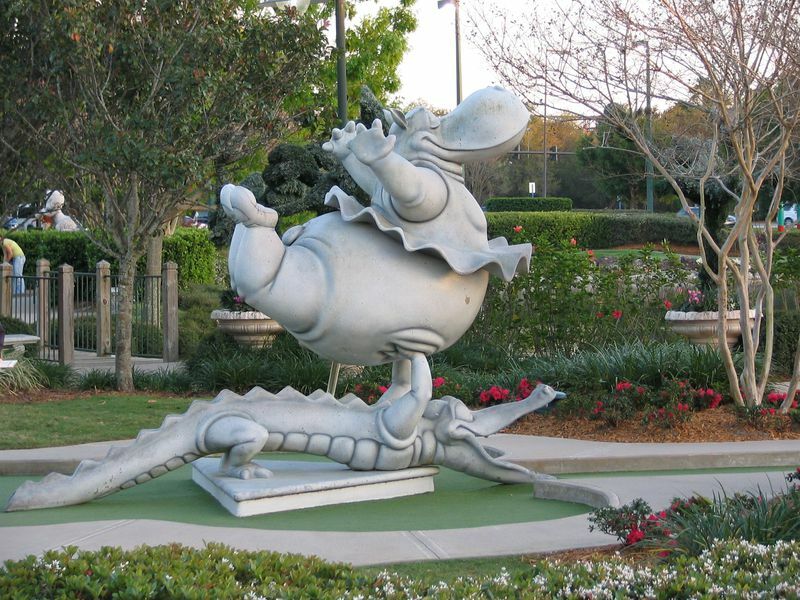 Myrtle Beach is called the “mini-golf capital of the world.” It is a popular course. It is the annual home of the United States Pro Minigolf Association Masters. And it is regarded as one of the toughest in the world. It is finely manicured. It is decorated with with hibiscus. It also has palm trees. But the real star of the course is the 40-foot concrete volcano. It was originally used as a prop. It was in a Dennis Hopper-directed movie. That movie was “Chasers.” The volcano now causes mini-golfers to regularly mess up their putts. Urban Putt: San Francisco, California. Urban Putt Promo Video from Limevoodoo on Vimeo. San Francisco’s landmarks come alive at Urban Putt. It is in the Mission district. It was thought up by former tech journalist Steve Fox. He saw it as whirling. He saw it as mechanical. He saw it as a high-tech course. Several people designed and built it. It was built by 65 local artists, designers and robotic experts. The holes are inspired by some of San Francisco’s most iconic attractions. It has the Painted Ladies. It has Lotta’s Fountain. And it has the cable cars. What do you think would be the most difficult feature that a course could have to challenge golfers? What would make it challenging? I think most difficult feature is having to hit the ball at a certain force so it will be able to go in the hole. I think that a subway station would be a difficult feature because there are many different floors and stairs. It would make it even more difficult if they added a moving train. What would make a golf course is when the golf ball could a able to hit the hole across the obstacles such as a house that has a wind across that the ball couldn't go through it it could fail easily.